Community Speed Watch is run by local communities and funded by the Police and Crime Commissioner for Wiltshire and Swindon, supported by Wiltshire Police, Wiltshire Council and Swindon Borough Council. 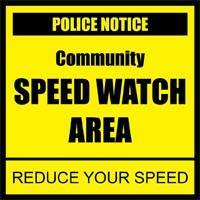 It gives residents a chance to help combat speeding in their local area. Community Speed Watch is a scheme that relies on volunteers to help deliver the purpose of ‘driving down speed, driving up safety’ in local communities. CSW teams will always be in pairs and will be highly visible in hi-vis jackets. Volunteers carry out roadside checks on the speed of vehicles using a speed detection device and record the vehicle registration number of those exceeding the speed limit. This information is submitted; Wiltshire Police staff then access the Police National Computer to check the information provided. The owners of the vehicles are then sent warning letters by Wiltshire Police drawing attention to the offence and advise the drivers of the consequences of excessive speed. Repeat offenders and those caught excessively speeding by fifty per cent or more are visited by their Community Policing Team.